The APR Pro is a fifth generation Acoustic Pulse Reflectometry inspection system for ultra-fast and reliable inner diameter (ID) tube inspections. Specially formed acoustic pulses are propagated through the air enclosed in a tube. Echoes generated by defects are recorded using special cutting edge microphones. Powerful algorithms identify the location, type and size of ID defects. Incorporating cutting-edge technology, the APR Pro has been designed with speed and mobility in mind. The lightweight, ultra-portable, battery operated probe is small enough to be carried in a backpack, while the absence of cables or calibration tubes makes the APR Pro easy to operate. 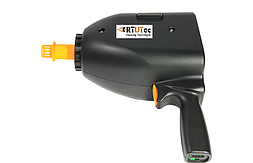 Highly sensitive to through wall holes (detects any hole with diameter of ≥0.5 mm) with under ten seconds for single tube inspection, enables efficient testing of 100% of tubes in shutdowns and emergency inspections. Experienced analysts are available 24/7 and guarantee top quality analysis and reporting every time. Self analysis and reporting is available with the advanced software option. Extremely sensitive to through-wall holes, blockages, and restrictions. Easy detection of ID wall losses (pitting, erosion). Ability to detect holes from 0.5 mm in diameter. U-bends, fin-fans, twisted, spiral wound tubes. Ferromagnetic and non-ferromagnetic metals, graphite and plastics. ID diameters from 6 mm (1/4″) to 50 mm (2″). Inspect tubes up to 20 metres in length, (depending on tube configuration and type). USB, Wi-Fi and Bluetooth connectivity. Extremely-fast, non-invasive inspection at less than 10 seconds per tube. No need for inventory of consumable probes or calibration tubes. Single user operation with minimal training requirements. User-friendly interface ensures reliable and efficient inspection, guiding the operator throughout the inspection process. Get reports from a highly trained and experienced analyst team in less than 24 hours after the inspection. Very light and convenient for fast transportation, battery certified for air freight. Entire system and accessories housed in a single and light backpack. Device: Length: 21 cm (8.27″) maximum. Width: 13.3 cm (5.24″). Height: 27.3 cm (10.75″). Weight: 2.23 kg (4.92 lbs). Backpack: Length: 50 cm (19.69″). Width: 33 cm (12.99″). Height: 20 cm (7.87″). Weight: 6.00 kg (13.4 lbs). Power supply: Battery operated: Li-Ion 14.8V. Dual voltage system (110V/230V). Operating temperature range: -10° to +50° C (14° to 122° F). Tube Diameter: 6 mm – 50 mm inner diameter. Tube Configuration: Any configuration including U-bends, finned tubes, twisted tubes and spiral wound tubes. Tube Material: Any material including: metals (ferrous and non-ferrous) and non-metals (graphite, plastics, ceramics). Tube Length: Up to 20 M length depending on defect size, tube configuration and type. Detectable Defects: Holes (≥0.5 mm diameter, smaller in some cases). Blockages: (Minimum of 5% of cross section). Inspection Speed: 10 seconds per tube in any tube configuration. Be the first to review “APR Pro ACOUSTIC PULSE REFLECTOMETRY INSPECTION SYSTEM” Click here to cancel reply.